As a new hunting season approaches I look forward to setting out on grouse and woodcock hunts with my dog Hera. As I look to the season ahead I remember the first grouse I shot 41 years ago in Limerick Forest. I was out with my dad and as we drove along one of the forest roads a grouse ran out in front of us. We stopped and got out of the white Volkswagen van he drove in those days. I was carrying my first shotgun, a Savage hammerless 16 gauge single shot with a 28 in. barrel and full choke. The grouse ran off the road and escaped, but my dad and I found there was a covey of birds. As we swept the cover there were multiple flushes with the birds flushing unseen. This was both exciting and frustrating for me, but my chance came when finally a grouse flushed and offered me a shot in a gap between a couple of fir trees. I mounted my gun and fired, a snap shot just like I read in the CIL guide to upland gunning. My dad heard the shot and asked if it was me. I replied it was me and walked up to the gap between the trees and there on the ground was my grouse. 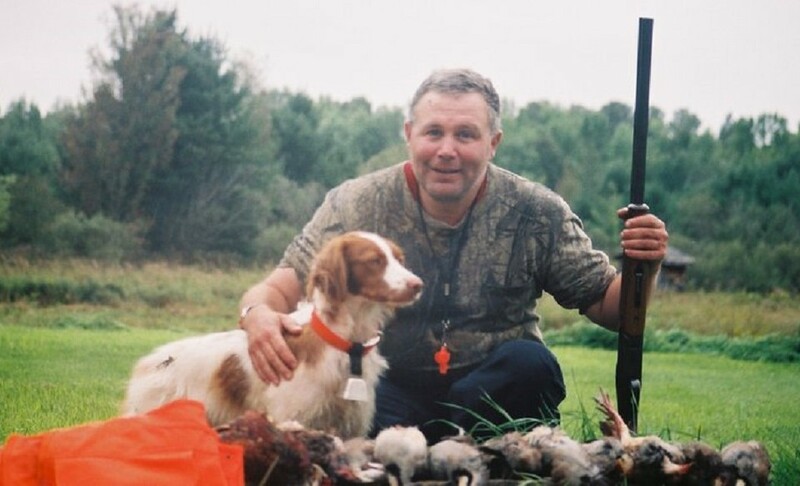 I sure was excited and cried out repeatedly “Dad, I got a grouse!” What I remember most about shooting my first grouse was the feeling of triumph and touch of sorrow I experienced when I retrieved the dead bird. I’ve come a long way in 41 years of hunting, learning more about the game, its habitat, and raised and trained four Brittanies. I’ve killed a lot of game over these 41 years too, mostly upland game birds, wildfowl and small game animals. My friend and hunting buddy Jason Quinn introduced me to the pleasures of big game hunting in 2011 when I took up deer hunting. I saw a deer that season, seated in my new ladder stand, and I sure was excited. The deer, a doe, approached from behind in a stand of pines. I watched out of the corner of my eye as the deer drew nearer, to the left of my stand and carefully moved into position to make the shot. The deer stopped at the edge of the pines and was partially hidden by the boughs of a pine. I watched and silently cajoled the deer to step away from the pine, but she kept still. I tried to find the mark through my scope on my old Remington 30-06 rifle, but the boughs blocked my view. I chose not to shoot as I did not want to risk a poorly placed shot that would only cripple the deer. Eventually, despite my earnest, heart-felt cajoling, the deer went on her way into the thicket and was gone. I took it in stride. It was a fair chase and this time the game got away unharmed. From that moment on I was hooked on deer hunting. I shot my first deer, a doe, in 2012. Killing my first big game animal was a proud moment for me. 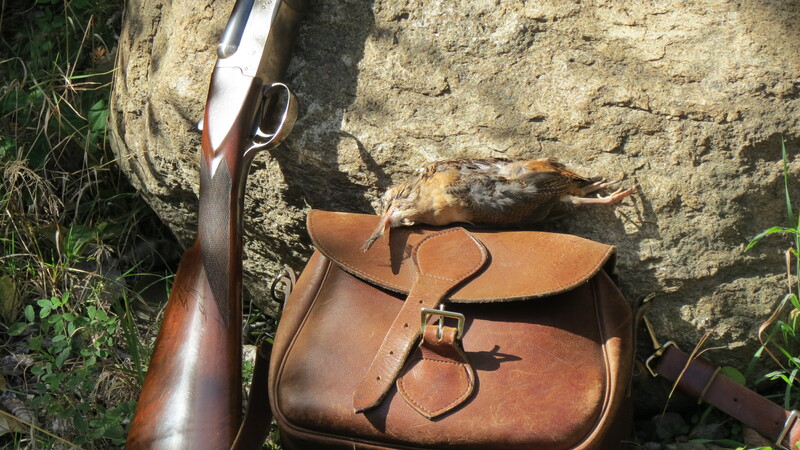 Yet, what I remember most after making the kill was experiencing the same feeling of triumph and touch of sorrow I had when I shot my first grouse 41 years before. Yes, while I am not squeamish about killing wild (or domestic) birds and animals, neither am I without feeling. Hunting means making the choice to kill wild game birds and animals. It is not a choice I make lightly nor capriciously. I am not in the field to kill for the sake of killing. In the deer seasons following my first kill, I passed up a number of shots at deer because the risk of a poorly placed shot was too great. Last season I missed a shot at a doe when buck fever got the better of me. Jason and I followed up the shot and found no evidence the deer was hit; better that than a gut shot deer! My experience with crippling losses with game birds weighs on my conscience. Yes, despite taking every precaution, including hunting over gun dogs, I suffer crippling losses on occasion. I cannot imagine how it feels to shoot and not retrieve a big game animal. When I take to the field this season, I am confident in my skill as a hunter to find and kill the game quickly and humanely in a fair chase. I will continue to do my best to avoid crippling losses. Through it all, the familiar feeling of triumph and sorrow will be part of the experience when I make a kill as it was when I started hunting 41 years ago.